The children's book 'A Squash and a Squeeze' by Julia Donaldson is about a woman who feels that her house is not big enough. 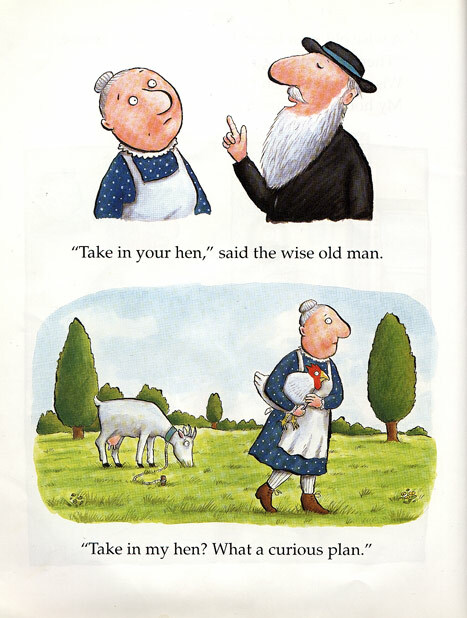 She meets a 'wise old man' (who looks uncannily like an old chassidish fellow! ), who tells her to bring animals into her home one by one (essentially to teach her a lesson in appreciation). After each animal enters her house the situation becomes more and more unbearably - all at the council of the wise old man. He eventually tells her to take animals out one by one and she begins to be grateful for the space she had in the first place. A number of people have mentioned to me that this is based on a midrash or chassidic story (or other?). Is there indeed an early source for this in Jewish literature? This is from an old Jewish Polish folk tale. A man's house is too crowded, so the rabbi tells him to bring in all his animals, one species at a time. When there are no more to being in, he tells him to take them all out. All of a sudden, the house feels so much roomier, despite staying exactly the same. Not the answer you're looking for? Browse other questions tagged sources-mekorot books-generally agada-stories-legends yiddish story-identification .